Several people have asked about the fall colors in NY as compared to Vermont. Well, I thought they held their own. 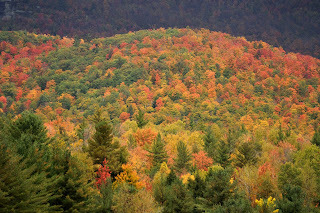 Here is an example of a hillside near Lake Placid. Which by the way, Lake Placid is great. We only had a little bit of time there as we drove to Fort Drum. One could easily get lost in the beauty of that area.